As the Certified Thread Educator for Canada since Feb. 2008, I teach nationally on behalf of Superior Threads. Would your guild members or store customers love to know more about thread and how to use it successfully? Book a workshop or program and get excited about thread! Have you ever wanted to experiment with different threads before buying them? Well, now you can! This is Superior's official "open thread bar" workshop - you bring your machine and I'll bring the Superior threads for you to play with. Learn how to choose the correct needle, and how to overcome your fear of the tension dial. We'll discuss the properties of the different threads available today so that you can make an informed decision when choosing thread. At the end of the day you will have a new perspective on threads and your own sampler as future reference. Your $5 kit fee will include a Titanium Topstitch needle, prewound bobbin, and use of all threads by Superior. Class notes, "Thread Therapy with Dr. Bob" DVD, plus a special 26-page handout are also provided. Threads are available for purchase after class. Have a taste of various machine applique techniques & sample some new products that are available to simplify the process. Learn both turned edge invisible and fused decorative methods. Threads make all the difference to your applique projects, and we will have yummy threads by Superior to play with. This is a stress free day focusing on process rather than project. You will have samplers of all the techniques for future reference instead of another UFO! Your $5 kit fee will include Titanium Topstitch needles, prewound bobbin, and use of all threads by Superior. Class notes, and "Thread Therapy with Dr. Bob" DVD are also provided. Are you overwhelmed when choosing threads for your quilting projects? With so much variety available today it can be both exciting and at times confusing. Make an informed decision - learn about the different fibres and weights, how to choose the correct needle, and how to adjust the dreaded tension dial. Overcome your fear of metallic and specialty threads. This is an informative, 45-minute lecture about all thread - not brand specific. Includes a door prize, and a 29-page handout that is emailed to guild members after the meeting. A copy of the DVD "Thread Therapy With Dr. Bob" is provided for the Guild library - compliments of Bob Purcell, Superior Threads. Threads are available for purchase. Are you frozen by choice? Do racks of thread make you nervous rather than excited? If you have the "deer caught in the headlights" look when choosing threads then it's time to take a deep breath, relax, and learn step-by-step how to select suitable threads. 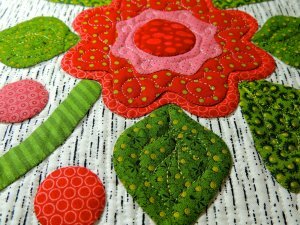 Piecing, quilting, stitch-in-the-ditch, invisible machine applique and decorative applique are discussed. See how different threads create different effects, and learn which needles should be used with them and why. Start looking at threads in a whole new way, and discover the freedom to use them effectively throughout your work. Mileage is charged at 54.0 cents/km from Dundas, ON unless other arrangements made. Long distance travel expenses include round trip airfare/parking/ground transport to & from airport, plus any baggage fees. Overnight accommodation if necessary. Billeting with a non-smoking guild member is fine, but wireless internet is a must. As I am no longer able to drive my husband accompanies me on driving destinations - his meals or extra hotel accommodation charges are my responsibility. If staying longer, meals to be reimbursed, or provided by host. Bag lunch for workshop to be provided (no allergies). Contract will be provided for both parties to sign.